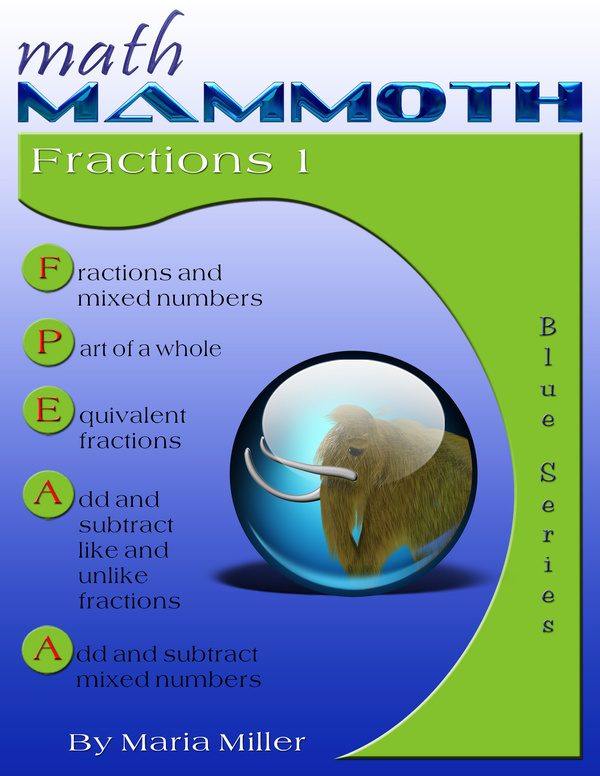 Math Mammoth Fractions 1 is the first book of two that covers all aspects of fraction arithmetic. This book covers the concepts of fraction and mixed numbers, equivalent fractions, adding and subtracting like and unlike fractions, adding and subtracting mixed numbers, and comparing fractions. The book Math Mammoth Fractions 2 covers the rest of fraction arithmetic: simplifying, multiplication, and division of fractions. I have made a set of videos to match many of the lessons in this book. You can access them here. Studying fractions involves lots of rules, and many students learn them only mechanically, not really understanding the underlying concepts and principles. Then they end up making lots of mistakes because they confuse the different rules and either apply the wrong one or apply the right rule but they do not remember it quite right. All this can make students even fear fractions in math. To avoid that, this book uses the visual model of a pie divided into slices, all the way through the book. It is a very natural model, because it uses a circle that can be divided into any number of circle sectors (slices). When students work with this model from lesson to lesson, they will eventually be able to "see" these pies in their mind. This, in turn, gives them the ability to do many of the easier fraction calculations mentally. It also enables students to really UNDERSTAND these concepts, and not just learn mechanical rules. You are welcome to use manipulatives along with the book; however the visual pie model is probably sufficient for most students in 5th grade level. I have also included (in the appendix) printable cutouts for fractions from halves to twelfths. You can use them to make your own fraction manipulatives. The first lesson, Fraction Terminology explains the various parts of a fraction as well as what the different types of fractions are known as. The student can refer back to this information as needed as he does the lessons in this book. The lesson Review: Mixed Numbers needs to be thoroughly understood before progressing further. The next lessons, cover adding and subtracting mixed numbers and are well illustrated with "pies" to help the student visualize the concept of regrouping fractions so they can complete the math. Then, it is time to study equivalent fractions, as a prerequisite for adding unlike fractions. Equivalent fractions are presented as parts that have been split further. The rule is to multiply both the numerator and the denominator by the same number, but try to emphasize the terminology of "splitting the existing parts into so many pieces" or something similar. That should help students to understand the concept instead of memorizing a mechanical rule. Adding and Subtracting Unlike Fractions is an introductory lesson in the sense that the student is not yet introduced to the rule for finding the common denominator. In this lesson, the common denominator is either given, or the student figures it out using pictures. Finding the (Least) Common Denominator emphasizes the idea that we need to find a common denominator, and then convert the fractions to like fractions before adding. Next we study Adding and Subtracting Mixed Numbers with unlike fractional parts, and add and have some word problems in this lesson to utilize the concept of converting unlike fractions to like fractions. Then we cover the concept of comparing fractions. Once the student has mastered converting two fractions to equivalent, like fractions, this should be fairly easy. The last lesson in the book, Measuring in Inches, uses pictures to illustrate measuring with inches and fractions of inches. This lesson gives the student a chance to see how fractions can become useful in measuring items in everyday life as it also has some word problems to solve using fractions. Answers are at the end of the book. The Fractions 1 workbook is most suitable for 5th grade. However, this book is not tied to any grade level and does not mention anything about grade levels, and so it can be used in various settings. It is also very good for remedial teaching or for the learning disabled because of its heavy usage of visual models. Math Mammoth Fractions 2 continues the study of fraction topics, covering fraction simplification, multiplication, and division, and is a sequel to this book. We have used Mammoth Math in the past when my child was "getting stuck" when it came to long division. And we purchased fractions from you about three weeks ago and I have to say fractions is coming easy. We tried various other curriculums for our homeschooling math and only yours has given my child both the visual, and hands on, in ways that he needed. In fact your method of teaching fractions is exactly how I learned when was in school in Australia. Thank you so much for a program that is easy to teach, easy to understand and easy to learn. My child actually enjoys math for the first time. We look forward to the next level of Mammoth math. Your [Fractions 1, Fractions 2] books have been such a help to us! My son has attended a private school since kindergarten, but we recently found out the school hasn't been teaching to grade-level standards in math. So, while he has wonderful grades, he is behind his peers from public school. He will be attending public school this fall, so we are using your worktexts to get him caught up this summer. I am not much of a "math person", so we are both benefiting from your series! The workbooks are WONDERFUL and I love how fractions are explained so simply and attractively, my 13 yo daughter is sure to understand fractions now. Thank you for a great teaching product! The students and myself liked the pictures and the step by step breakdown in all of the lessons. These books fill the gap between using manipulatives (concrete level) and abstract (symbolic) level. Too often students are expected to make that leap from the concrete level without spending time at the representational level. I am amazed at how effective these lessons are. I think what makes them interesting to my student is that the problems are often interesting to solve, with an interesting word problem or just the mathematical reasoning interests her in a way that I've never seen with her. I began homeschooling my daughters back in May of 2008. Math Mammoth was one of the first websites that I came across on the internet. I had looked over Maria's site. I began targeting my math homeschool after what she provided as far as course knowledge. I began throwing long division and fractions at my oldest daughter. She totally freaked out. She kept telling me that she was not taught many of these subjects. I began teaching her what I knew about these particular subjects. As time moved forward, I realized that I need to check and see where she was at in her math. I emailed Maria on this. She suggested many websites that I could test my daughter. I found out that she was a year and half behind. I thank God that I found Maria Miller's website because I have purchased the fraction book to help my daughter. She now has fractions down pat. She also has the long division down as well. Maria takes these problems down to the basics and explains in excellent detail how to solve a fraction or long division math problem. Without the tools that she has given me, I would not have been able to bring my daughter forward and current on her math skills. Maria teaches it as I was taught many many years ago. She provides the tools to help our children succeed in mathematics. I just wish that there were more websites like hers in the other subjects. I am currently using the Geometry module for my youngest daughter. She is enjoying that module immensely. It explains it perfectly for her. Thank Maria for having an incredibly useful website and books. I thank the heavens above for someone like you. I recently bought two of your books [Fractions 1 and 2]. I am a public school 8th grade math teacher. I use your materials to go back and fill in the "gaps" for children who have missed important concepts in their past education. Your products have worked wonders!!!!! I can't get over how complete and rigorous they are.